For some reason, the brilliant summer sunlight, the vibrant hummingbirds in the yard, and the intensely blue skies with sunsets that defy the imagination all remind me strongly of Maxfield Parrish’s romantic and dazzling artwork (click on the links to see his bio and work). I have always loved his figures who are evocative of romance and play. It has driven me to find a little of that feeling in my jewelry. So here goes! And here is my favorite Maxfield Parrish- breathtaking isn’t it! 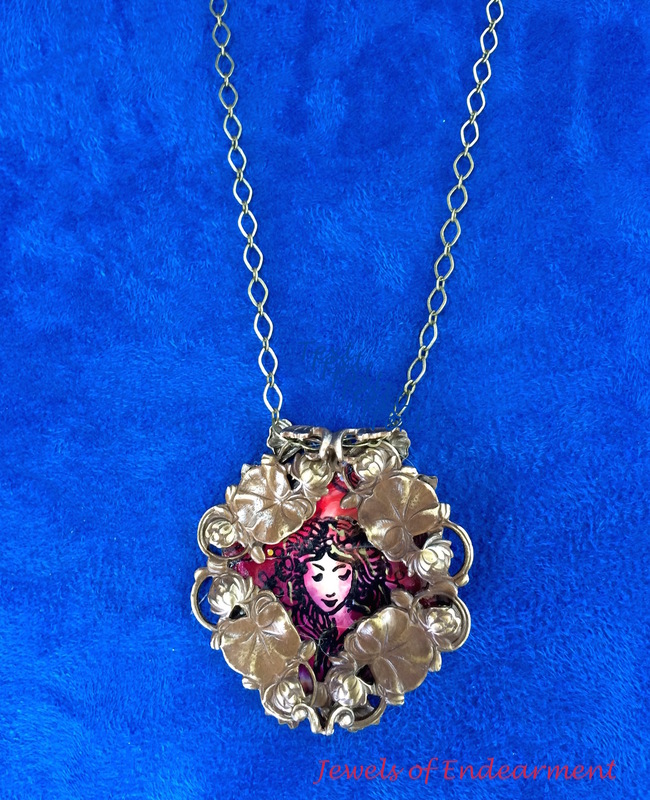 This entry was posted in Artists, Bracelets, Necklaces and tagged Artists, Bracelets, hand colored, Hand crafted, handtinted, layered stampings and filigree, Maxfield Parrish, necklaces. Bookmark the permalink. They’re all so gorgeous! I love the colours! And the portraits fit so well into the jewelry. I loved the Radiant Garden necklace. Nice work!